The Annual South Hampton Roads Mayors Forum. 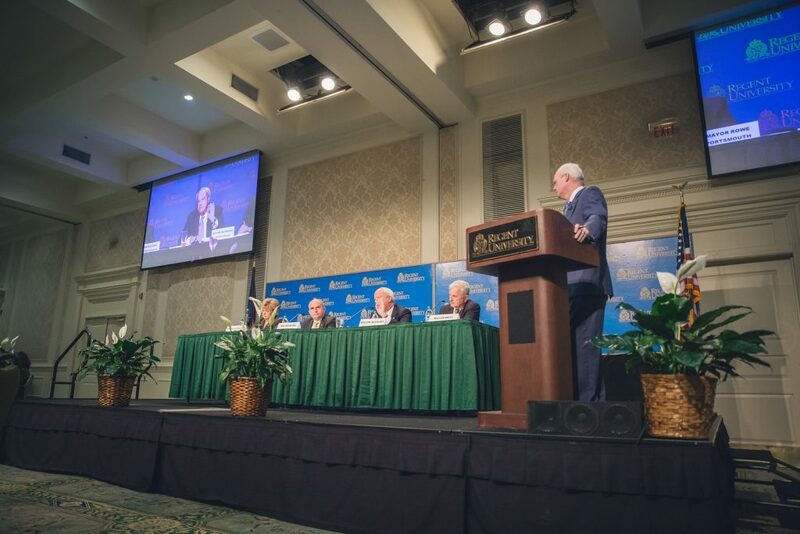 On Wednesday, April 11, Mayor of Suffolk Linda Johnson, Mayor of Portsmouth John Rowe, Mayor of Virginia Beach William Sessoms, and Mayor of Chesapeake Rick West joined Regent University’s Executive Leadership Series at the Founders Inn and Spa. The annual event invites the mayors from each of the Hampton Roads area’s major cities to participate in a Q&A-style forum, with questions submitted from attendees. The event was moderated by WTKR/WGNT anchor Les Smith. Top of the docket for discussion was concern for the security and safety of the area’s schools. Johnson, who served as a school teacher, before her tenure as Suffolk’s first female mayor, articulated “mixed feelings” about the ever-growing debate of whether to arm teachers. “It’s going to be hard to even comprehend what this cost is going to be, but it’s going to have to be done if we’re going to survive,” said Sessoms. West acknowledged the completion of the Veterans Bridge and organizations like Dollar Tree bringing jobs to the area. “People think that we’re growing too fast so there’s a perception that we’re growing too fast and that our growth is out of control,” said West. “I don’t think we’ve done a good job explaining what the plan is that we have in place to control that growth.”The next question addressed the recent decline in retail – addressing the fact that more stores closed in the area in 2017 than they did during the nation’s recession. Smith asked each mayor to “forecast” a year from today and share how they are working to support retail and new jobs. Sessoms quoted tourism as critical to the area’s continued success. He proposed that Virginia Beach continues to invest in real estate and for opportunities to bring people to the city. West said he was “encouraged” by the work Virginia Beach is doing with fiber optic cables and foresees that industry bringing an asset to the area – along with the growth of the area’s 500 new businesses created this year. Johnson acknowledged Suffolk’s growing mark in the food and beverage industry, reffering to her city as the “caffeine capital of the world,” with businesses like Pete’s Coffee and Lipton Tea bringing jobs to the area. Rowe is a self-proclaimed “optimist” on the region, stating that over four decades the area has come a long way. He listed the area’s top opportunities for jobs as the department of defense and the port. Where the area’s tax dollars are spent, and how the budget is allocated was next on the agenda. Smith asked the mayors what they believed they were spending too much money on, and what they hope to invest in further in the future. “We’re spending too much money on unfunded mandates from the federal and state government,” explained West. Johnson agreed, adding healthcare to the list of budgetary pain points. “We will always be spending on infrastructure and trying to keep [it] up to make sure that people have a good quality of life,” said Johnson. “Things wear out like bridges and roads, as we look to the future that is going to be a big need,” said Rowe. Finally, each of the mayors were asked what their city should do to strengthen their neighborhoods. Rowe cited amendments to zoning ordinances to protect the welfare of the nation’s oldest planned neighborhood and revitalizing older cities. Sessoms once again stressed the need for strong schools and public safety systems, while working to combat flooding in the area. West agreed, citing the areas schools and upkeep with the city’s infrastructure. Johnson emphasized bringing about the area’s sense of belonging and opening communication with the area’s citizens. Regent’s Executive Leadership Series will continue Fall 2018.